The existing natural environment on earth is declining fast due to human interference. Plansup would like to slow down this degradation process by providing advice, training and planning support to private and public organizations that would like to analyse and reduce their impact on the environment. Both climate change and biodiversity loss are the result of the pursuit of maximum profit in combination with short term thinking. As a consequence, natural resources are often not used in a sustainable way. But it has become evident that we have to change our attitude towards the environment. We have to act now and not wait for tomorrow. More and more companies realize that they need to change their business models if they want to sustain in the long run. Businesses need to integrate Corporate Social Responsibility in their management in order to achieve a healthy balance between People, Planet and Profit. Plansup provides support to achieve this balance by identifying and quantifying the pressures on the environment. Depending on the implementation scale (national, provincial, sectoral, company or product) the impact can be analysed for both current and future situations. Plansup wants to help businesses to measure their impact for different parts of the chain. This impact is summarized in the companies’ environmental footprint. Plansup focuses on the main pressure types. Advice will be provided which measures will achieve optimal results with relative low efforts. Trade-offs between productivity and the environment are identified, and the effectiveness of environmental friendly measures is tested. Even though the reduction of impact of one single company will provide only a small contribution to the restoration of our environment, it is an essential step towards a mutual understanding how the impact can be reduced. Together businesses can provide a significant contribution. This entry was posted in Geen categorie on 10 October 2018 by Hoofdpagina. On Thursday 13 September 2018 a presentation about the new Biodiversity Footprint Calculator for companies has been given at the Netherlands Environmental Assessment Agency (PBL). This entry was posted in Geen categorie on 18 September 2018 by Hoofdpagina. Recently solar panel fields pop up like mushrooms in the Dutch landscape. The are even told to be nature friendly. 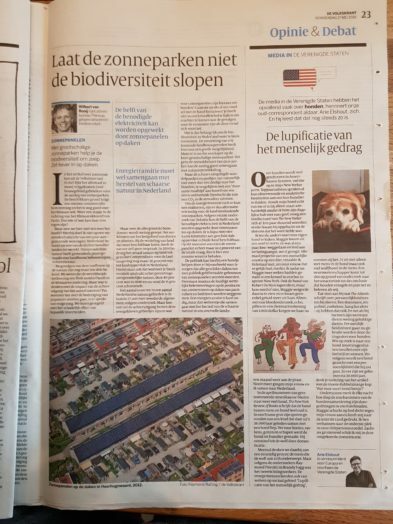 We need to change from fossil fuels to clean energy sources but this should not compete with initiatives to increase the biodiversity in the Netherlands. With one of the lowest biodiversity levels in the world (MSA = 15%) the extent of natural habitats is far too low. The trend of converting some of the former agricultural lands to nature faces now competition by the expansion of solar panel fields. Currently less than 5% of the electricity in the Netherlands origins from solar panels. According to recent research, solar panels on suitable rooftops could increase this percentage to 50%. So let’s first focus on using more solar panels on rooftops before we start competing with nature. With large-scale solar parks, you can destroy biodiversity. In the article about solar parks (Nederlands Dagblad 15 May) it all seems so beautiful: use the released agricultural area of quitting farmers for construction of solar parks. The available land gets a new commercial destination and it is good for the climate too. Another step in the direction of the Paris climate agreement. So who or what can be against this development? But are not we missing out something here? I am not talking about the reduced view of a few adjacent homes. The Netherlands belongs to one of the most densely populated countries in the world. Original nature has largely been converted to agriculture, buildings and infrastructure. The consequences of this overuse of nature is only partly known. We know that worldwide deforestation has a significant share in climate change. But what about the impact of the decline in species populations? Only when it comes to the threat of some popular species there is some concern. But little is being said about the biggest culprit: Reducing the habitat of animals and plants by conversion of land. In the distribution of land that becomes available again, nature itself has no say. In 2014, the acreage of nature on land was according to the Compendium for the living environment (Netherlands Environmental Assessment Agency) only 26 percent of the land surface of The Netherlands. This source also states that when you express biodiversity as a percentage of original nature, it was 40 percent in 1900 and now fluctuates around 15 percent. One of the other causes of inefficient land use is the decision to hand over the planning of business parks from provincial to municipality level. While the provinces took into account the danger of cluttering rural areas and safeguarding existing nature, municipalities are mainly focusing on the attraction of job employment. That is why they offer land for businesses as cheap as possible. As a result, companies are less efficient with the use of space. Instead of building in height, you see now an expansion of low rise business parks along the motorways. versus solar park initiatives. Will this be a second attack on our scarce space? According to recent publications the number of insects in a number of Dutch nature reserves dropped with two thirds over the last 27 years. But how much is the decline outside these remaining areas and what will be the consequences? You do not have to look into a crystal ball to come up with the consequences for the economy if this trend is to continue. It is therefore important to increase the biodiversity in the Netherlands. The conversion of released agricultural plots offer a good opportunity for this. But there are now rivals in the field: large-scale solar parks. According to the developers of these solar parks, their construction can go well together with nature development. But small herbaceous borders, hiking paths and frog ponds are of course no more than a poor gesture. You can compare it to a ‘sustainable meal’ on board of an intercontinental flight that spills tons of CO2 emission into the atmosphere. In order to realize the necessary energy transition, there are alternatives needed for the land-devouring solar parks. According to recent research by Deloitte half of the required electricity in the Netherlands can be generated by solar panels on roofs. There is almost 900 square kilometers of suitable roof surface available in the Netherlands. At this moment solar panels only provide 2 percent of the total demand. So a huge step can be made here. Politicians can help a hand here by enforcing installation of solar panels on suitable roofs of buildings that are paid with public money. In addition, the current statutory obstacles with the production of solar power on private roofs and that of companies should be taken away. An energy transition is badly needed, but it should be one that goes along with the restoration of scarce nature in our crowded country. Met grootschalige zonneparken help je de biodoversiteit om zeep. denken over de impact van de achteruitgang van het aantal soorten? land dat weer beschikbaar komt,heeft de natuur zelf geen inspraak. vooral oog voor het aantrekken van zo veel mogelijk werkgelegenheid. landbouwpercelen biedt hiervoor een goede mogelijkheid. Maar er is nu dus een kaper op de kust: grootschalige zonneparken. vraag. Dus is hier enorme winst te behalen. This entry was posted in Geen categorie on 7 June 2018 by Hoofdpagina. On Monday 16 October 2017 a presentation about the Biodiversity Footprint method for companies was provided at the Ministry of Economic Affairs in Den Hague. Results were shown and follow up has been discussed. Click here for the presentation. This entry was posted in Geen categorie on 19 October 2017 by Hoofdpagina. Plansup has developed in collaboration with the Netherlands Environmental Assessment Agency (PBL), Wageningen Environmental Research (Alterra), CREM and JSScience a biodiversity footprint methodology. Studies were initiated by The Natural Captains project of the Platform Biodiversity, Ecosystems & Economy (Platform BEE). This Platform is stimulating companies to translate thinking and working with natural capital into tangible actions. This means making visible the impact of their activities on biodiversity and natural capital in terms of their biodiversity footprint. One way to assess a company’s impact on biodiversity is to measure the biodiversity footprint of their current activities and possibly also to compare this footprint with that of alternative measures. Two studies have been carried out. In the first Plansup study (van Rooij, 2016) the established GLOBIO biodiversity impact assessment method by PBL has been adapted to determine the biodiversity impact of companies, and of their products and services. The resulting biodiversity footprint method was tested in three case studies and has now been extended and applied a further six case studies in the Natural Captains project. See for more information and the resulting study reports the Footprint companies web page of this website. Based on these case studies, the method has been evaluated for wider application. For this purpose, a simplified Biodiversity Footprint Tool has been developed in which the integrated impact of two pressure factors – land use and greenhouse gas emissions – can be uniformly determined. The tool is still under development but will be made operational soon in collaboration with IUCN. A description of the web tool can be found at the naturalcapitaltoolkit website. This entry was posted in Geen categorie on 23 May 2017 by Hoofdpagina. Underneath an overview of assumptions and equations that I have been using for my latest GLOBIO3 assessment of the current biodiversity in Mongolia that I carried out early March 2014. For livestock I used FAO livestock maps and national statistical data on livestock in Mongolia. First I converted the different livestock units for Cattle, Sheep and Goat into so called Sheep units and made one Sheep unit map. Secondly I used statistical data on Cattle, Horses, Camels, Sheep and Goat per province (Aimag) to correct the total sheep unit map. With data on the average yearly consumption per Sheep unit a average consumption map could be made. In 1981 the Russians made a fodder production map for Mongolia. As the general land use in Mongolia has hardly changed over the last decades I assumed that this fodder production map is still valid. By dividing the two maps by a raster calculation a grazing intensity map was created with 6 grazing intensity classes; 4 classes on natural rangelands: no grazing (MSA_nr = 1), light grazing (MSA_nr = 0.9), moderate grazing (MSA_nr = 0.7), intensive grazing (MSA_nr = 0.6), and two classes on degraded rangelands: very intensive grazing (MSA_nr = 0.5), and overgrazing (MSA_nr = 0.3). This classification was used in combination with the latest global MSA rangeland table to address local MSA_land use values which are mentioned in brackets behind the local rangeland classes. The global GLOBIO3 rangeland MSA table distinguishes 5 types of rangeland: Natural Rangeland (MSA_rl = 1), Moderately used rangelands (MSA_rl = 0.6), Intensively used rangelands (MSA_rl = 0.5), Man made grasslands (MSA_rl = 0.3) and Ungrazed abandoned rangelands (MSA_rl = 0.7). In addition to rangeland classes the following land use types could be distinguished for Mongolia: Extensive cropland (MSA_crl = 0.3), Urban area (MSA_urb = 0.05), Natural forest (MSA_nfor = 1), Natural bare <glaciers and rock outcrop> (MSA_nb = 1) and Mining (MSA_min = 0.3). The pressure caused by Infrastructure is calculated based on the direct pressure from roads and the indirect pressure around urban, agricultural and mining areas in Mongolia. The width of the impact zones was set to 5 km around roads and to 10 km around the mentioned impact areas. In previous assessments an infrastructure tool was used to distinguish the impact along roads by zone and population pressure, but this methodology is not used in GLOBIO3 anymore. Instead the direct and indirect impact is calculated separately and then combined. For the calculation of direct impact on natural forests I used the following equation: Con(“Rd_dist” > 5000, 1, (2.0 * ( Exp(-3.99998 + 1.093457 * Ln(“Rd_dist”) ) / (1 + Exp(-3.99998 + 1.093457 * Ln(“Rd_dist”)))) + 4.0) / 6.0) and for the direct impact of roads in non-forest natural areas I used: Con(“road_dist”) > 5000, 1, (2.0 * ( Exp(-8.861673 + 1.697327 * Ln(“road_dist”) ) / (1 + Exp(-8.861673 + 1.697327 * Ln(“road_dist”)))) + 4.0) / 6.0). Note that the /(+4.0/6.0) part is added to the equations because the cause-effect relation is only known for 2 species groups (birds and mammals) out of 6 species groups that would be needed to give a more representative result of the impact on biodiversity. This pressure is in general absent in Mongolia. Only in the area near the capital city of Ulaan Baatar Nitrogen deposition will be high as air pollution is high due to traffic, coil stoves in the houses and the large coil fueled electricity plants. If a map of Nitrogen deposition had been acquired the following calculation would have been applied: first calculating the exceedence of Nitrogen: N exeedence = Nitrogen deposition – Critical load. The cause-effect relations are known for three ecosystems: Arctic-Alpine ecosystem, Boreal coniferous forest and Grassland by applying resp the following equations: MSA_nitro = 0.9 – 0.05 NExceed; MSA_nitro = 0.8 – 0.14 ln (NExceed); MSA_nitro = 0.8 – 0.08 ln (NExceed). Global maps of Nitrogen deposition and Critical loads can be acquired freely from the Netherlands Environmental Assessment Agency. However, detailed information on Nitrogen deposition around Ulaan Baatar was missing and therefore the impact of this pressure has been omitted for this assessment. The slopes in the above table have been used to calculate the MSA_clim for Mongolia: MSA_clim = 1 – (Slope * Δtemperature)/100. I will let you know when a new publication is published on the website. Please also share your experiences, assumptions and results of your GLOBO3 assessments on the Biodiversity Modelling Network (BMN) so that we can learn from each other’s experiences!